Wow. Makes County Fair look bustling. It did get an overhaul and renovation not that long ago. Though, I do agree, more work is yet to be done. That Sears has to learn that Retro is only cool when its new retro, not old retro! Bathurst couldn't even handle a Wal-Mart chain? In HRM there isn't really a dead mall per say. Our former main street (Barrington St) could qualify though for a dead street and before the redevelopment occured Penhorn Mall in Dartmouth was looking pretty gloomy. Looks like Bathurst has nothing but malls. This one is the worst mall in Sherbrooke, and it's still open but 90% empty. Price Chopper closed? How does that place survive without it? I lived at Oxford and Wonderland for 1 year (What a mistake! Immediately moved back downtown when my lease was up) and they had the craziest Dollar Store ever right by the west entrance. The owner was Indian and they had some really whack stuff. That must be the samosa/fax joint. I think we have to remember that what we consider dead in Canada is not really dead. Yes the downtown malls were the malls that could be considered dead and did empty out. But a lot of the suburban malls listed, were not or are not really dead. They may not have the big name chains, but they are home to local mom and pop stores that do cater to the surrounding area. Places like Don Mills Centre were not dead. They were not busy like huge regional malls, but they still have their pllaces in the retail world. In fact I remember reading an article a year or two ago that said Canada does not have as large or even the same dead mall issue as the USA does. And one of the reasons is actually public transit. Our malls actually are transport hubs, and people still go to the mall, instead of just big boxes, and the transit helps, if people can take a subway or a bus direct to the mall. Anyway all I am saying is, Canada really is not doing that bad. We do not have super regional malls which have done empty the way the USA has, etc. In fact our malls are just as popular as ever, and are always reinventing themselves. Scarborough Town Centre near my house, is just packed. Malls never have really fallen out of favour like the news makes it sound like. Don't forget to shop at EATON PLACE(Now City Centre) in Winnipeg. This is from when Downtown Winnipeg was the retail mecca of the city. Nah, Wal-Mart built a stand alone store across town a few years back. When it went, everything else went with it. Bathurst has two other malls...not bad for a city of less than 20,000. Agreed with furr..er...Rusty on this one. North Hill is very convenient to get to; less than 100m from one of the entrances to the Lions Park LRT station. This is much closer than Chinook or Southcentre is to the LRT. The two 55+ residence towers above the mall certainly help its viability. The renovations helped as well. The Sears is the notable exception though. It still looks like it did when it opened way-back-when. Has anyone mentioned Cavendish mall in Montreal? It actually used to be pretty busy 10 years ago, but its sort of dead now. It can't beat Decarie though. I have a strange urge to go and take pictures of both malls tomorrow. The former anchor was actually Kmart, which closed when the chain went under in the late 90s. I was very surprised to see Price Chopper close, because of the proximity of a lot of off-campus Western students, but I believe the nearby Costco really took away sales from Price Chopper. London Mall opened in 1968-69 with Food City and Kmart as anchors. 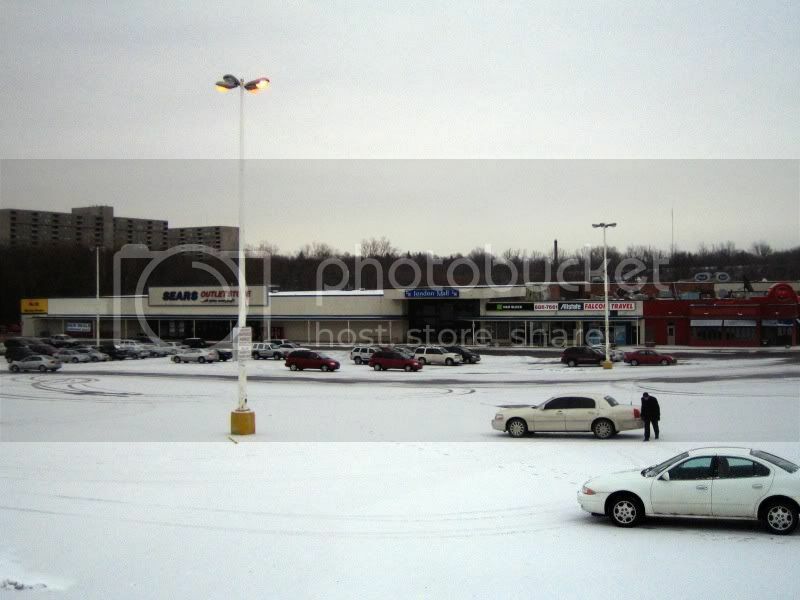 I took this photo of London Mall in January 2008. About the only thing going for this mall right now is Kelsey's. It was bustling. Dropped in for groceries around 2000. Sliding downhill at the end with the closed Eatons (still had a Caplan Duval). Went back again in Spring 2004: Deader than some of the octogenerians skulking about with their scratch and lose lotto cards. Decarie Square has been dead almost as long as has Humphrey Bogart. EVEN IN THE 1970's, it was deadsville. Check out the New South China Mall: the biggest, deadest one of all. New South China Mall (simplified Chinese: 华南MALL; pinyin: Huánán MALL) (formerly South China Mall) in Dongguan, China is the largest mall in the world based on gross leasable area, and ranked second in total area to the Dubai Mall. That Honeydale mall is utterly pathetic. I enjoyed the link and the photos. I always found Franklin Mall pre-TNT Supermarket moving in, to be quite a sad, dead mall. But once T&T moved in, it's pretty busy, at least from what I saw the last few times I was there. It's really too bad International Village isn't more busy with less vacant stores. It's quite a nice space and great location. I only go there for Tinseltown (movie theatre) and to the 7-11 to buy snacks to sneak into said movie theatre. But it's pretty dead most days. I guess since we're broadening our definition of what constitutes a mall, I might as well through in a few little malls from Waterloo Region and Guelph. It's not empty, but it's not much either. Anchor tenants include Valu-mart, a bowling alley, and a cinema with only 2 screens. There is a coffee time and a dollarama there, and a whole bunch of small businesses, including one that sells saris if I'm not mistaken. About as retro as it gets. What it looks like outside on streetview. This was a dead mall once the Sunrise Power Centre was built 1km south of there. More recently the former interior hallway was scrapped and a massive Great Canadian Superstore was built in its place, so it's no longer an indoor mall. It's almost totally occupied now, even during this recession. What it looks like outside. Market Square in downtown Kitchener. A planning blunder from the 1960s. The only functional retail component to this place is the food court upstairs, and even that's mediocre. There's also a convenience store and a Goodlife Fitness upstairs. Almost the entire main level is vacant, with Trios college planning to take over much of the vacant space. The back has been taken over by the Record (our main newspaper) and the entire basement has been taken over by Stantec Engineering's regional offices. It's pretty amazing how it went from a retail powerhouse with department stores to an oddly shaped office building in just a few decades. What it looks like on google streetview. King Centre in downtown Kitchener. Another planning blunder from the 1960s, similar to Market Square but worse. For the last decade or so, it has housed Manulife Financial's offices and about 1,500 or so employees work there. So if you're wondering why there is a lack of tall office buildings in downtown Kitchener, it's because most office uses are in the former malls. The King street entrance on streetview. Features Liquidation World, Smitty's, and a call centre. Not much more needs to be said. Located in the "ghetto" of Guelph, this mall's main anchor tenants include a No-Frills and a Zellers. Interior decor is similar to Frederick Mall's in terms of its tacky retroness. Franklin Mall is downright frenetic most of the time. It often approaches Beijing levels of foot-shuffling, noodle-slurping crowds. Hey, this thread is still here! A little update since my last post, the Safeway that was stuck in the 80's/90's went through a reno a few months ago, and now are like every other updated Safeway around the country. 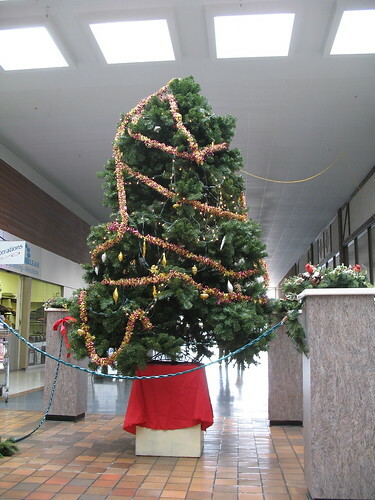 That interior pic of Frederick Mall looks exactly like the inside of Northgate Shopping Centre in Winnipeg, which is another mall that's dying, or dead. Just a cheap theatre and Zellers anchoring it. That's pretty much it. That better not be a crane shot.